ALL-ITEMS: For the month of August 2017, Belizean consumers experienced a 0.7 percent increase in the average cost of goods and services frequently purchased by households, when compared to August of 2016. The All-Items Consumer Price Index for the month stood at 104.4, an increase from 103.6 in August of 2016 (See Figure 1). For the first eight months of 2017, a year-to-date inflation rate of 1.3 percent was recorded. TRANSPORT: A key element in the overall rise in consumer prices was an overall increase of 5.2 percent across the ‘Transport’ index (See Figure 1). International airfare prices were significantly higher in August 2017, rising on average by about 49 percent in comparison to that of August 2016. Domestic bus fares, following the price increase which took effect in late 2016, were 8.2 percent higher than they were in August of last year. ‘Fuels and Lubricants’ experienced a relatively small increase of 0.9 percent as the price per gallon of Premium gasoline, rose from $10.51 in August 2016 to $10.62 in August 2017, Regular gasoline rose from $9.46 to $9.79, while the price per gallon of Diesel was up from $8.74 to $8.801 (See Table 1). HOUSING, WATER, ELECTRICITY, GAS AND OTHER FUELS: Prices within the ‘Housing, Water, Electricity, Gas and Other Fuels’ category recorded an overall increase of 1.4 percent when compared to August of last year. This was mainly attributed to a 0.9 percent increase in home rental costs and a 13.2 percent increase in the average price for Liquefied Petroleum Gas (LPG), as the average cost of a 100-pound cylinder of LPG rose from $87.76 in August 2016 to $99.31 in August of 2017 (See Table 1). FOOD AND NON-ALCOHOLIC BEVERAGES: For the month of August 2017, consumers saw a slight decrease of 0.7 percent in the ‘Food and Non-Alcoholic Beverages’ category (See Figure 2). Various food items including beef steak, pig tail, whole chickens, flour, milk and eggs recorded a decrease for the month (see Table 1). The category of ‘Alcoholic Beverages and Tobacco’, on the other hand, was up almost 7 percent in comparison to August of 2016, reflecting an 8.2 percent increase in the average price of beer. Across the seven municipalities2, Dangriga once again recorded the highest increase in consumer prices for the month at 3.8 percent. As in previous months, this municipality recorded the highest rate of increase for home rental prices, an item on which households spend a relatively large proportion of their monthly budget and which therefore impacts heavily on the overall Consumer Price Index. Conversely, Orange Walk Town, which recorded the biggest drop in home rental costs, also experienced the lowest inflation rate for the month of negative 1 percent. August 2017: Belize’s total imports for the month of August 2017 were valued at $143.2 million. This was a decrease of 9.5 percent or $15 million from imports for August 2016, which totaled $158.2 million (see Figure 1). Imports into the ‘Commercial Free Zones’ recorded the largest drop for the month, falling by a considerable 35 percent or $9.1 million to almost $17 million (see Table 1), with items such as cigarettes, bags and women’s clothing being among the goods recording decreases. The categories of ‘Machinery Transport Equipment’ and ‘Other Manufactures’ also saw notable reductions for the month of August 2017 (see Table 1). While reduced imports of telecommunications equipment and motor boats drove the former down by $6 million from $39 million to $33 million, decreased purchases of sporting equipment, prefabricated buildings and lighting fixtures led to the $3.6 million drop in the latter, from $18 million to $14.4 million. In addition, the ‘Beverages and Tobacco’ category was down by more than one half, from $3.4 million to $1.5 million, as the country imported less cigarettes and alcoholic beverages for the month of August 2017 (see Table 1). These decreases, however, were partially offset by greater imports of ‘Food and Live Animals’, ‘Mineral Fuels and Lubricants’ and ‘Chemical Products’. Increased imports of wheat seeds prompted the $2 million growth in the ‘Food and Live Animals’ category during the month, from $16.7 million to $18.7 million. Higher imports of Premium fuel were largely responsible for the $1.9 million rise in the ‘Mineral Fuels and Lubricants’ category, from $16.1 million to $18 million, notwithstanding the fact that the quantity of Diesel fuel imported fell by a half. Furthermore, the month of August saw noticeably more imports of insecticides, PVC pipes and medicines in comparison to the same month of last year. As a result, the ‘Chemical Products’ category went up by $1.9 million, from $11.3 million to $13.2 million. FIRST EIGHT MONTHS OF THE YEAR: Merchandise imports for the eight months January to August 2017 totaled $1.2 billion, representing a 5.8 percent or $74 million decrease from the same period last year (see Table 8). Imports declined markedly across five categories over the period, including ‘Machinery and Transport Equipment’, ‘Commercial Free Zones’, ‘Food and Live Animals’, ‘Export Processing Zones’ and ‘Other Manufactures’, which together fell by a combined $115.2 million. Among these, the most significant decline was recorded for ‘Machinery and Transport Equipment’, which dropped by $74 million, from $318.7 million to $244.5 million during the eight month period. However, increased spending on ‘Mineral Fuels and Lubricants’, ‘Chemical Products’ and ‘Manufactured Goods’, which together grew by over $39 million, served to partially offset the period’s decreases (see Table 8). 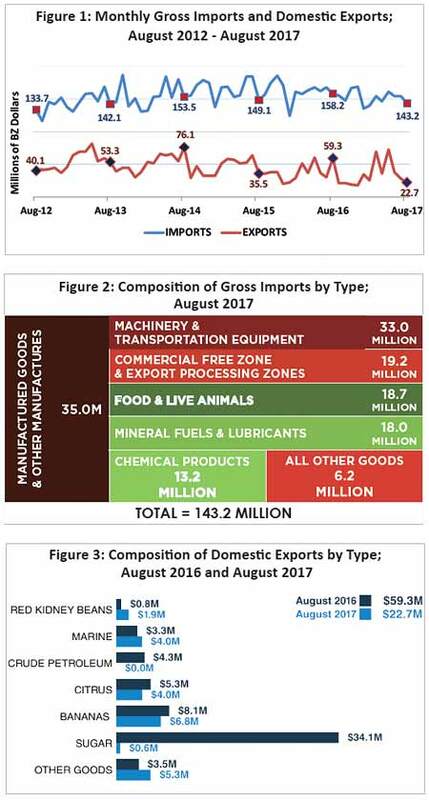 August 2017: Total domestic exports for August 2017 amounted to $22.7 million, down 61.8 percent or $36.7 million when compared to the $59.3 million recorded for August 2016 (see Table 5). A difference in the timing of bulk sugar shipments for 2017 compared to 2016 was the primary cause of the plummet in export earnings for the month. While in August 2016 Belize exported $34.1 million in bulk sugar, during August 2017 sugar exports comprised only of bagged sugar, valued at a minimal $0.6 million. Further adding to the decline, there was an almost across the board drop in the country’s other major exports during the month. There were no sales of crude petroleum for August 2017, in contrast to $4.3 million in export earnings from this commodity in August of 2016. Receipts from citrus products fell by one fourth, from $5.3 million to almost $4 million, owing mainly to reduced orange concentrate exports, while banana sales went down from $8.1 million to $6.8 million. On the other hand, marine exports saw marginal growth of $0.7 million, from $3.3 million in August 2016 to nearly $4 million in the same month of 2017, as lobster tail exports almost doubled, from $1.2 million to $2.3 million. Of note, the month also saw heightened exports of red kidney beans, with sales for that good rising from $0.8 million to $1.9 million. Exports to the United Kingdom were down significantly during the month, falling sharply by $26.7 million from $31.9 million in 2016 to $5.2 million in 2017, due for the most part to the reduction in sugar sales. Lower exports of sugar, orange concentrate and bananas led to a $7.8 million drop in earnings from the rest of the European Union, from $11 million to $3.1 million. The absence of crude petroleum sales for the month was the principal cause of the $2.8 million falloff in revenues from the CARICOM region. The European Union as a whole accounted for more than one third of the country’s exports for the month, while CARICOM and the United States each accounted for more than a quarter of total export revenue (see Figure 4). FIRST EIGHT MONTHS OF THE YEAR: Merchandise exports for the period January to August 2017 totaled $327.4 million, up 1.9 percent or $6.2 million from the $321.2 million recorded during the same period last year (see Table 5). Three of the five major exports saw increases during the eight month period, contributing positively to the overall growth in export earnings. Sugar exports rose from $102.1 million in 2016 to $109.8 million in 2017, while banana sales went up from $50.2 million to $53.5 million. The marine category, largely due to higher shrimp and lobster tail exports, increased by $2.7 million over the period, from $22.3 million to almost $25 million. In contrast, citrus products, Belize’s second largest export revenue earner, saw earnings for the January to August period decrease by approximately $14 million, from $80.8 million in 2016 to $66.8 million in 2017. There was virtually no change in crude petroleum exports over the period, with earnings declining by a negligible $0.7 million in comparison to the same eight months of 2016.